2016 marks the 14th Anniversary of Rainskates. From the beginning, we have offered options for skaters that are not found elsewhere. After hand shaping over 500 custom old school decks, we transitioned out of that market to concentrate on the wheel line. Thanks to input and feedback from skaters around the world, what started with the original Orange Tsunami, has now become a line-up of 27 wheels, with most hard formula's being offered in single, and double conical versions. No matter where, how, or what you ride, there is a perfect Rainskates wheel for you! All RS wheels are made in the USA from premium, high-rebound urethane, featuring hard urethane cores, to assure precision bearing alingment, regardless of the wheels Durometer. 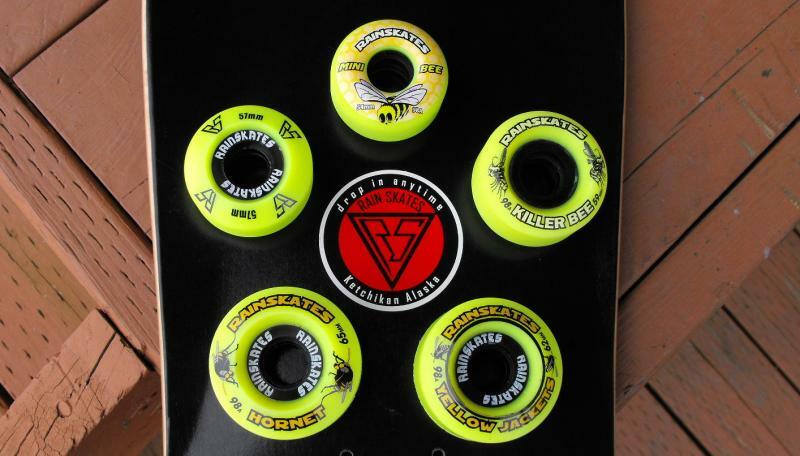 Sticking to the old school way of each wheel color relating to a specific hardness, the Rainskates wheels follow this tradition with the following 7 formulas. The wheels are available for sale at the bottom of each page, either via links to the Ebay store, or directly through e-mail (and Paypal). Lime Green/92a: Faster & firmer. Green/95a: Excellent grip on slick & rougher surfaces. White/100a: Faster yet, but not too slick. A quick thanks to the legions of RS riders and fans around the Globe, who have helped to make this Company the survivor that it is. Giving you, the wheels that YOU want! More good things will be coming, so check back soon!